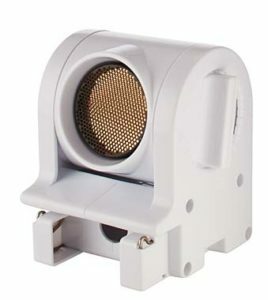 The PASCO Wireless Motion Sensor is small enough to fit in the palm of your hand, as light as a 6-oz. can of soda, and smart enough to automatically sync with your desktop, smartphone, or iPad. Being wireless, there are no cables to get in the way of the echolocation it uses to measure position, velocity, and acceleration of objects. 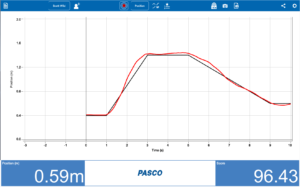 It can detect movement within a range of 15 cm to 4 m.
Recommended for Wireless Motion Sensor users: PASCO’s free MatchGraph! software. When I unpacked my new PASCO Wireless Motion Sensor, I admit, I was concerned. The included one-page manual when spread out, barely covered my hand. Could PASCO really fit everything I needed to know on that (large) postage stamp? Turns out they could. Even for those of us who aren’t scientists, the device is intuitive. In fact, it took me less than five minutes to unbox, setup, find the power button, and sync to the free app/software on my laptop and my iPhone. Unpack the device. Plug it in to charge. You’ll know that has happened when the yellow light on the back turns green. While you’re waiting, download the free software to your phone or laptop (or iPad). Tap the Bluetooth button to pair the device. Play around with it to see how the sensor works and how changing the position affects the appearance of the graph. If you are in the middle of a project, you can open saved data or open an existing project. These can be applied to any number of subjects including agriculture science, biology, chemistry, Earth, engineering, environmental, Life Sciences, Physical Science, and physics. For ideas on how, check out their YouTube channel. Scroll below the top screen and find dozens of videos on subjects like Ohm’s Law, acid-base titration, and the physics of bridges. You can also visit PASCO website’s Digital Library for hundreds of free labs and experiments that can be sorted by age group (elementary, MS, HS, AP, or University) or subject. PASCO offers a wide variety of training options through their resource page. This includes videos, free live online training, customized webinars, and onsite workshops. Some are free while others are for a fee. Something I don’t often see in equipment providers is curricula. PASCO offers curricula in Chemistry and Physics, complete with textbooks, eBooks, and their own award-winning equipment. They meet NGSS standards and work within Google Classroom and most LMSs. If you’re a science teacher, you can’t find a better selection of hands-on science products with a history of reliability and fulfilling dreams than PASCO Scientific. Do yourself a favor and visit their website.